Slaveholders in Maryland used slaves to cultivate wheat and tobacco, or to perform domestic work and skilled labor. Slave owners saw their slaves as property, sources of revenue, status symbols and important investments. They also saw them as dangerous threats who needed to be controlled and kept at bay. Owners feared runaways would encourage other slaves to escape-or rebel. When slaves escaped, masters might punish those who remained. Ricksom Webb was a free black man who owned slaves, an unusual but not unheard of situation. Like his white counterparts, he enforced the cruelties of slave labor system in Maryland. Owning slaves possibly elevated Webb's status in society, even among whites. Webb owned at least six slaves, including Alfred, who tried to escape from his Caroline County farm in 1844. Rev. John Ashton, a Jesuit priest at the White Marsh Church in Prince George's County, lost many slaves who not only ran away, but who also challenged him in court. Two groups of slaves escaped from Ashton at the end of the eighteenth century. The Queen family, a group of twelve, fled in 1795. Three years later, brother Charles and Patrick Mahoney also ran away. Both groups unsuccessfully sued Ashton for their freedom. Ashton manumitted the Mahoney brothers in 1804, but the Queen family remained in slavery. Ashton and Webb challenge the traditional portrait of slave owners. As a clergyman and a free black, respectively, they illustrate that slavery was an institution which sometimes outweighed moral and racial conventions. Rixom Webb was a free black land owner who lived in Caroline County Maryland. It is unknown where he was born and who his parents were, but it is likely Rixom Webb was from Maryland. Rixom Webb married Hester Chase February 18, 1834 in Dorchester County, Maryland. Rixom Webb and his wife Hester had the following children: Harrison, John, James, Eliza Ann, and Peter. Webb owned a sizable amount of land in his lifetime. In addition to the land he owned in Caroline County, he bought and sold land in Dorchester County and would eventually relocate to a large tract of land in Talbot County. When Rixom Webb's property was assessed in 1841 in Caroline County he owned 20 acres of Banningland. No value was listed for the property. The assessment also listed 450 acres of land worth eighteen hundred dollars. On this particular farm Webb owned horses, mules, steer, and cattle. Rixom Webb also owned slaves which added value to his estate. He owned at least 6 slaves: Harriet, Alfred, Luke, Jerry, Asbury, and Ann. Harriet was listed in Webb's 1841 assessment to serve ten years and was worth $120.00. In 1842 Webb was assessed $530 for three slaves that he owned in Caroline County, MD. On April 24, 1844 Webb's enslaved boy Alfred fled his plantation. Webb placed a runaway ad for Alfred in the Cambridge Chronicle with a reward of $5.00. He purchased Alfred at a Sheriff's sale from the estate of Doctor Absalom Thompson of Talbot County, Maryland. Alfred initially belonged to Doctor Thompson's father Anthony Thompson who willed the Alfred to his son. 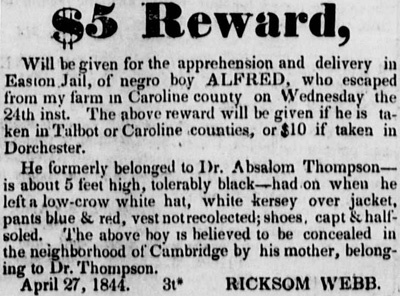 In May 1844, Alfred was eventually caught and returned to Rixom Webb, who then sold him to Anthony C. Thompson, brother of Absalom Thompson, who lived in Dorchester County. Harriet Tubman hired herself out to this same Anthony C. Thompson who was the step brother of her owner Edward Brodess. Rixom Webb's status as a free black landowner also presented a unique issue for local lawmakers. When the state legislature's Committee of Education was deciding how to raise money for the Caroline County Academy, a bill was proposed specifically to exempt Webb from being taxed for that purpose. The proposal was debated and rejected shortly before his death in 1846. Therefore, Webb's significant taxable property served the ironic role of supporting schools that his children and grandchildren were most likely unable to attend. John Ashton, a Jesuit missionary, was born in 1742 in Ireland. He entered the society of Jesus on September 7, 1759, and was sent to work in Maryland in 1767. Ashton was in charge of the White Marsh Mission, in Prince George's County for thirty-nine years. Ashton was one of the early contributors to Georgetown College and in 1784 was named Procurator General. Ashton was a slave owner in the Queen Anne District in Prince George's County, MD. According to the 1790 Census, John Ashton owned 82 slaves. In 1791 one of Ashton's slaves Edward Queen brought a suit against his owner for assault and battery and false imprisonment, in which the court ruled in Ashton's favor. Several of Ashton's slaves ran away from his service in the late 18th and early 19th Century. On one occasion twelve of his slaves, members of the Queen family (Simon, Billy, Jack, Lewis, Isaac, Paul, Matthew, Tom, Billy, Nick, Tom, and Fanny), ran away in May 1795. In the April term of 1796 Ashton freed the following members of the Queen family: Basil, Billy, Charity, Edward, Jacob, John, Mary, Nelly, Nicholas, Simon, and Stephen. Simon and Billy are the only two slaves out of the twelve who ran away in 1795 that were freed by Ashton. Father John Ashton died February 4, 1815 in Maryland.